The third and final Elimination Round of the Jack Link’s Major League Fishing 2013 GEICO Challenge Cup followed the pattern set by the first two days of elimination competition. Anglers found increasingly ominous conditions coming as Hurricane Sandy grew closer to swiping the coast of the Sunshine State on its way north. The conditions, coupled with the fact that Lake Istokpoga was completely new to so many of the anglers, meant that the fishing started off slow, then pick up as the anglers became more familiar with their surroundings. The first two competition days showed the first and second periods to be very slow, while the afternoon periods were a mad rush to the finish line for the four qualifying spots to advance to Sudden Death. Elimination Day Three was very similar. Much of the lake, Zone 1 featured expansive vegetation beds and fields of reeds. However, at the top end of the lake, Istokpoga's Arbuckle Creek pours in and the eastern shore also holds canals with plentiful boat docks from the houses bordering the canals. While things began slowly, as normal, the talented field of anglers did find the keys to decode the equation that makes up a competitive bass fishing day. Elimination Day Three competitors included Tommy Biffle, from Wagoner, Okla., Brent Chapman, of Lake Quivira, Kan., Jeff Kriet, of Ardmore, Okla., Aaron Martens, of Leeds, Ala., Mike McClelland, of Bella Vista, Ark, Takahiro Omori, of Mineola, Tex., Kevin VanDam, of Kalamazoo, Mich., and Byron Velvick, of San Antonio, Tex. As happened on the previous two days of competition, it took a while for the field to begin to get comfortable with their surroundings on Istokpoga. With only 15 minutes to scout the entirety of the fishing zone in order to select a starting spot, the anglers do their best to guess correctly with limited information. The first angler to reap the rewards of their information processing was Kriet, who posted the first keeper to the real-time leader board at 7:57 a.m. local time, with a 1-pound, 3-ounce largemouth. 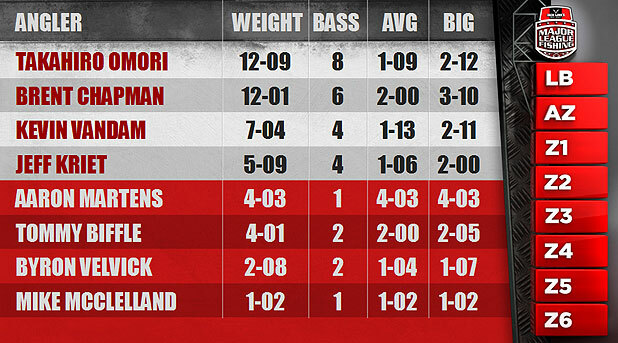 Chapman, filling in for Mark Davis, who was recovering from offseason surgery, was the next angler to make his presence on the leader board known. Chapman posted consecutive catches at 8:04 and 8:07. Velvick was the next to begin putting the pieces of the puzzle together when he boated his first keeper at 8:41, then Kriet scored eight minutes later with his second keeper. Two minutes later, McClelland made his first appearance with a small keeper. He was followed by Omori, who put his first fish in the boat at 8:54. Martens made his first entry to the leader board with the first period's largest fish, a 4-pound, 3-ounce kicker that hit at 9:12. One minute later, Omori caught his second fish, and then Biffle put his first fish into the boat at 9:19. A few more scores were posted in the next several minutes, and at 9:43, VanDam put his first keeper in the boat, meaning that every angler in the day's field had registered a catch on the leader board. When the period ended, it was Omori who appeared to have put things together the best. His four keepers gave him a total weight of 7 pounds, 3 ounces, as well as the first period lead. Chapman showed that he was comfortable in the Major League Fishing format, producing two quality fish to land him in second place with 4 pounds, 4 ounces. Martens' lone keeper was good enough to end the period in third place with 4 pounds, 3 ounces. He was followed by Biffle, who totaled 4 pounds, 1 ounce, for his two keepers. Kriet sat in fifth place with 3 pounds, 9 ounces, followed by Velvick with 2 pounds, 8 ounces. VanDam sat seventh with 1 pound, 6 ounces, and McClelland rounded out the field with 1 pound, 2 ounces. Altogether, the anglers produced 16 keepers in the morning session. While Lake Istokpoga was less than completely giving with her catch rate during the day's opening period, she became downright stingy for most of the anglers during period two. In fact, only four anglers in the field managed to produce keepers. Two anglers managed to produce the lion's share of the fish recorded in the period. In the first half of the second period, Omori posted four fish by targeting mixed grass in the northwest corner of the zone. Chapman navigated his way up Arbuckle Creek and managed to post four fish in the second half of the period. Kriet and VanDam managed to catch two keepers each. With those being the only four anglers to catch fish in the period, it made sense that they were the only anglers to climb in the standings. Omori ended the period in the lead with 12 pounds, 9 ounces, while Chapman stayed hot on his heels with 12 pounds, 1 ounce. 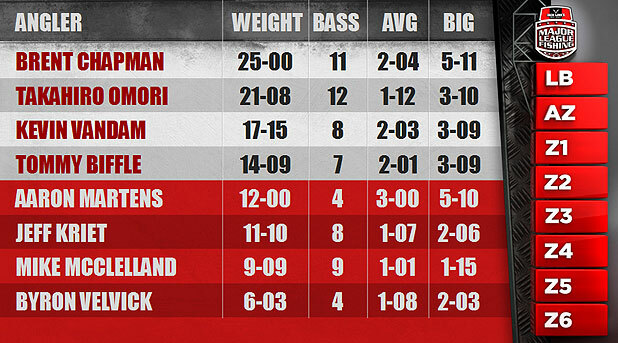 VanDam moved up to third place with 7 pounds, 4 ounces, and Kriet sat in fourth place with 5 pounds, 9 ounces. Martens fell to fifth, Biffle to sixth, Velvick to seventh and McClelland remained in eighth. While the second period may have been the slowest in the history of Major League Fishing, the afternoon period may very well have been the busiest. While only 12 bass were recorded in period two, the group nearly tripled that output in the final period with 34 keeper bass being recorded on the leader board. With that much activity, the third period more closely resembled the first round of a Mike Tyson fight than it did a fishing tournament. While there were often lulls of activity that lasted 20 minutes between postings in period two, the longest time between catches in the final period was six minutes at any one time. Chief amongst the "catchers" in the final period was Chapman, who managed to boat five keepers up in Arbuckle Creek. He also boated the largest of the day, a 5-pound, 11-ounce bass that quickly moved him into the lead. He added four more fish throughout the period to bring his total weight for the day to 25 pounds even, enough to win the qualifying round. 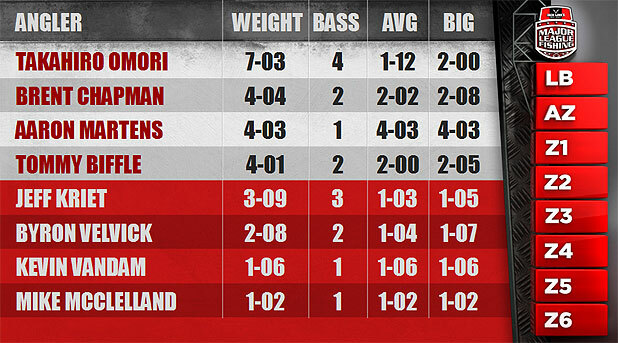 Omori added four more fish himself in the afternoon session and was able to hold on to second place. His consistency throughout the day produced 12 keepers - the highest total for the day - and allowed him to finish with a total of 21 pounds, 8 ounces. VanDam began to dial things in during the final period. He produced four keepers and ended the day with a total of 17 pounds, 15 ounces, good enough to take the third qualifying position. He was followed by Biffle, who, like Chapman, found his way into Arbuckle Creek. Biffle was able to land five keepers and leap from sixth into the final qualifying position with 14 pounds, 9 ounces. Martens became the first man outside the bubble with his 12-pound total weight for the day. Following Martens in sixth place was Kriet with 11 pounds, 9 ounces. Despite early success, Kriet was unable to capitalize in his areas enough to make it into a qualifying position. McClelland made a valiant charge in the end. While he spent most of the day with only one keeper, he caught eight in the final period and raised his weight to 9 pounds, 9 ounces, but finished seventh. Velvick finished eighth with 6 pounds, 3 ounces. With the completion of Elimination Day Three, the Sudden Death roster is now set and we are halfway towards finding out who will be crowned champion on Lake Istokpoga.